When will be James Martin's French Adventure next episode air date? Is James Martin's French Adventure renewed or cancelled? Where to countdown James Martin's French Adventure air dates? Is James Martin's French Adventure worth watching? 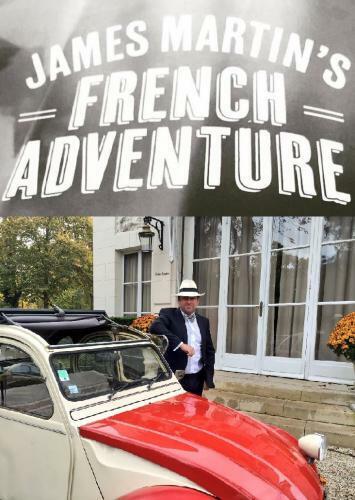 Chef James Martin sets off in an old 2CV to track down the old French culinary haunts of chef Keith Floyd. In episode 17, James visits Claude Monet's house in Giverny, peeking inside his kitchen, James sets up his own mobile kitchen nearby to cook a delicious dish of crab and dulse. Later down the road, Eric Guerin serves James pike, one of Monet's favourite ingredients, at his restaurant Le Jardin des Plumes. Also, in a nearby orchard, on the day of their annual harvest, James cooks an autumnal treat of apple doughnuts. In episode 18, James arrives in the French capital and one of his favourite cities in the world, Paris. Well known for its love affair with the baguette, James learns about the Poilane Bakery, that dates back to 1932, which specialises in sourdough. Paris is home to both artisans and fine dining and James is lucky enough to visit the kitchens of world renowned chef Pierre Gagnaire. In episode 19, James visits the golden palace of Versailles and its food market, where James shops for some ingredients for his first dish – sole Veronique, which he cooks at the King's allotment, the Potager du Roi. Travelling to the East of Versailles, James meets chocolatier Patrick Roger who makes sculptures out of chocolate before casting them in bronze or aluminium. In episode 20, to finish his French adventure, James visits the Bois de Boulogne, a park on the outskirts of Paris and it's race day at the Auteuil Hippodrome. There James meets a fellow-Yorkshireman and champion jockey James Revelly. James also pays a visit to the Michelin-starred Pré Catalan restaurant and enjoys his favourite meal of the trip. James Martin's French Adventure next episode air date provides TVMaze for you. EpisoDate.com is your TV show guide to Countdown James Martin's French Adventure Episode Air Dates and to stay in touch with James Martin's French Adventure next episode Air Date and your others favorite TV Shows. Add the shows you like to a "Watchlist" and let the site take it from there.